Providing a positive customer experience (CX) and the impact this can have on revenue, remains a hot topic within business circles the world over. And for sporting venues, the relevance and importance of CX can be huge. Stadiums and sports grounds face a lot of competition. Fans and visitors nowadays are paying for an ‘experience’. They want the whole package and what venues deliver at every stage of the process will impact on the perceived value of their proposition. In short – CX could be the difference between achieving healthy ticket sales and successfully encouraging return visits, or losing out. At sporting events, the key to success with CX is to provide a smooth, well though through experience for fans, while finding ways to provide added value – which is where fan zones come in. What is a fan zone? 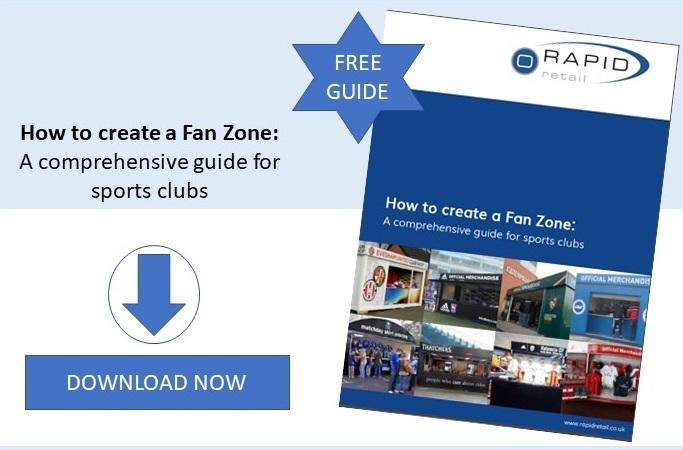 Various definitions of a ‘fan zone’ can be found online. One example being the use of large screens erected in town centres and other public spaces, which are designed to create an area for fans without tickets to come together and feel part of the action. But the idea has evolved massively in recent years. While most sporting venues have been providing some form of pre and post-match entertainment for years, the delivery of such services is now becoming far more structured and sophisticated. Fan zones are starting to be created onsite at most major stadiums and can also increasingly be found within smaller sports grounds. Such zones – also referred to as Fan Villages – will usually open hours before the main event gets underway and often reopen following the final whistle. They will include a range of bars, eateries and entertainment, along with shops and other merchandise offerings, such as shirt printing facilities. Live music and performances are now a regular fixture at many, along with family-friendly and CSR-related activities. How are fan zones created? Fan zones are usually located in an external area within or near the grounds and will be designed to make the maximum use of the space that is available. The most effective fan zones will be designed as a complete scheme, with the experience and flow of visitors taken into consideration when planning the layout and what will be offered. In the past, tents, canopies and food trailers may have been used, accompanied by some form of seating. But these structures naturally have limitations, especially when it comes to both comfort and managing the effects of poor weather conditions. Increasingly, more robust temporary structures, such as pop up shops and kiosks, are being utilised. Portable units of this kind are very cost-effective and can be fully powered and branded, providing a highly professional appearance, as well as improved usability. They also have the advantage of being secure when not in use and are capable of being fitted out for a range of different requirements – from catering units, to retailing, shirt printing, and creating areas for family-focused, or experiential marketing activities to take place. Larger walk-in units allow visitors to enter and touch, try and buy merchandise, replicating the shopping experience found on the high street. Providing additional retail units of this type has the added benefit of aiding queuing times, by helping to take some pressure off existing onsite shops. The end result being that sales are maximised. What makes a successful fan zone? Whether you have limited space and budget, or a generous investment to make, the key to a successful fan zone is to design it around fan experience. For any new fan zone, the most important thing is to focus on the potential user. Do your research and ensure the entire process places the visitor at its core. What will they want to see and find in the zone? How will they physically use the area? Make it an experience for all the senses and something that adds real value. Sports venue retail solutions for maximising revenue – what are the options? Why are so many Europe football clubs using pop up shops? What can lower league football clubs do to provide a great ‘fan experience’? For over a decade, Rapid Retail has been working with retailers, brands and sports clubs across the UK and Europe. For more information and examples, check out Fan Zones, view our gallery, or call the team at Rapid Retail on 01386 555044.